Winchester introduced the Model 55 in June of the year 1924. This was a brand new variant of the Model 94 Sporting Rifle, and it was apparently introduced to fill the gap between the standard Model 94 Sporting Rifle with its 26-inch barrel and the standard Model 94 Carbine with its 20-inch barrel. It was offered in calibers 30 W.C.F., 25-35 W.C.F., and 32 W.S. with a 24-inch rapid taper nickel steel barrel. Production of the Model 55 began on June 26th, 1924 and it ended in late December of 1932. The total production is estimated to be 20,580 rifles. The Model 55 was initially offered in Take Down only, but was changed to solid frame only in early 1931. It is estimated that 82% of the total production were Take Downs, making the solid frame variant relatively rare. Initially, the Model 55 was serialized in its own serial number range, with serial numbers 1 – 12002 completed through March 7th, 1928. After March 7th, 1928, the Model 55 serial numbers were co-joined with the Model 94 until the end of production. Special order options were offered but are rarely found. The most common special order option was a Stainless Steel barrel. 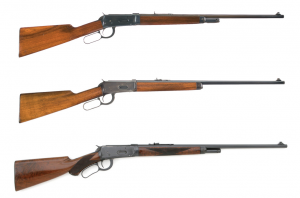 The Cody Firearms Museum research office has the Polishing Room serialization records for all of the independent serial number range rifles, and for all of them in the Model 94 serial number range.